Beautiful confetti balloons make your party attractive. These confetti balloons will be great accent to your event. And you will get a colorful shower after blast the balloons. Party Decoration Balloons Already Filled with Paper Dots: Strong latex balloons are Popular in birthday, wedding,proposals, graduation, anniversary and award ceremonies.These party balloons make great festival mood or Seasonal accent. No Need to Seal/Tie the Balloons at all: Simply blow the balloons, the free blow helper that comes with each latex balloon will held air for one day. It greatly saves your time and energy. Remember don't blow it too early. Most Favored Balloon Size for Parties: Each party decoration balloon can be inflated to approx. 30.5 cm/ 12 inch. Confetti is circular dot shape glittering in 1.5 cm diameter. Disperse Balloon Confetti Tip: Before inflating, spray some water into balloons and rub the balloons that filled with confetti with towel to lay them evenly on the inside of the balloons. Moisture will help the confetti to stick to the inside face of the balloons. 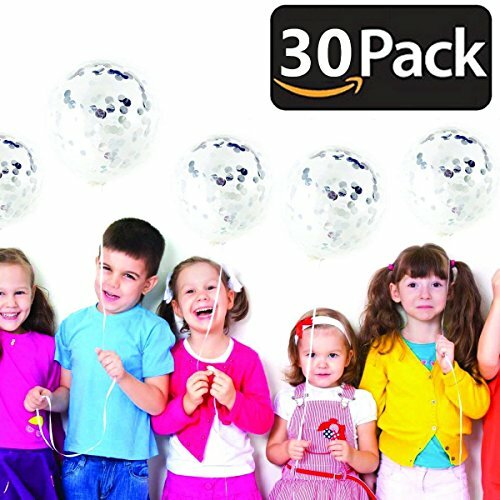 You Will Get: 30 pc Confetti Balloons with 30 Day Money Back Warranty.Feel free to contact us if you are not happy with the decoration accent balloon you purchased.No risk in buying. If you have any questions about this product by Bollovi, contact us by completing and submitting the form below. If you are looking for a specif part number, please include it with your message.